Please refer to our stock # 2032 when inquiring. 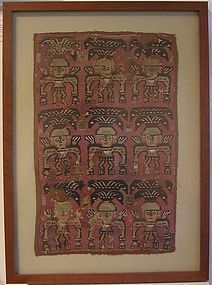 Framed Chimu Textile Panel with nine figures, Peru, ca. 800 - 1200. Textile Panel is 18" high x 11 1/2" wide. Frame size is 23" high x 16 3/4" wide x 1 1/4" deep. Estate of Miss Kate Kemper, London. Tightly woven, multi-color, rectangular panel having three horizontal rows, each containing three warriors wearing elaborate headdress. Some fraying, repairs and small losses due to age, but in very good condition. Ex: Miss Kate Kemper collection, London. Mesoamerican and Andean cultures both buried their dead with large quantities of textiles. This Chimú textile from Peru's north coast was part of a burial. A standardized Chimú frontal pose allows the mythical being depicted to display its elongated serpentine limbs, which end with the head of the Moon Animal. The projections from its head are likely representations of circular ear spools which are common among Chimú and other North Coast artifacts. These ear adornments, together with the crescent headdress are traits of human costume, which are combined with the animal-like limbs and teeth.